Even with a stable economy, companies continue searching for ways to cut back on expenses without compromising the quality of service. An excellent opportunity comes from using poly mailers, which are highly effective for e-commerce businesses. Poly Mailers are polyethylene shipping bags which are waterproof, tear proof, self-sealing, and tamper resistant and also very affordable. These polyethylene bags are available in several options including clear shipping bags, white shipping bags, and even custom poly mailers to create brand identity. These mailers are also lightweight that make their handling easier. As a result, employees who handle packaging and shipping will find it easier to perform their duties, especially if your company processes a heavy volume of shipping on a daily basis. Instead of lifting heavy or awkwardly sized boxes, they deal with small and lightweight mailers. There is a good chance that you would see an increase in production and better employee morale. As Poly Mailers are easy to handle and lightweight than the corrugated boxes, that means that you would pay a lower postal rate when shipping items out. Poly mailers also accommodate water-based or pressure sensitive shipping labels. Using this type of mailers is thus a great way to reduce business expenses, regardless of the industry. With the money saved, you have an opportunity to increase your budget in other areas. Polyethylene bags also resolve storage issues. With smaller and lightweight mailers, you have a lot more space for items that are being prepared to ship. With conventional boxes, even small ones, space is occupied quickly, but with mailers, you gain up to 90 percent more space. Depending on the volume of products shipped, you might be able to downsize the required storage or warehouse space. By choosing custom poly mailers, you have an excellent medium for marketing your business and brand. If you think about it, a smartly designed custom poly bag will be seen by virtually everyone who handles the mailer outside of the company, including postal workers, delivery drivers, air couriers, and so on. Even if your mailers end up at the front desk of a customer’s business, your custom bags with a logo will be visible to anyone who passes by. Poly mailers and envelopes provides robust security and protection which makes them the best choice for shipping purposes in all sorts of handling and weather. 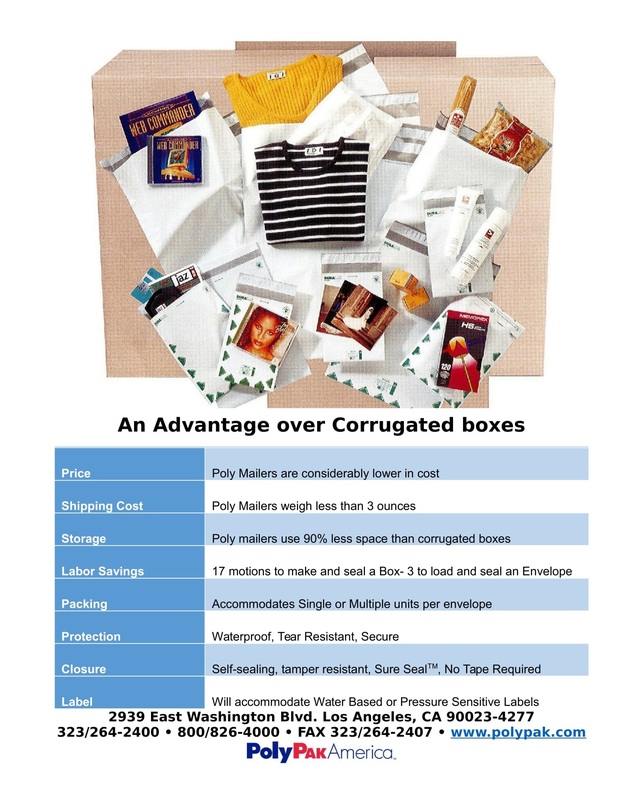 For more information about the products that we offer, please visit our website www.polypak.com. You can also call us directly at our toll-free number 800-826-4000 to speak with a company representative. All our products are Made in USA.